This piece is part of Ting Yuen’s Sisterhood Series. This painting represents my oldest sister and me. We are eight years apart and I used to follow her around all the time. I envied her -in a good way- thinking how beautiful she was. She reminded me of a princess, so sophisticated and elegant, I thought I could never be like her. 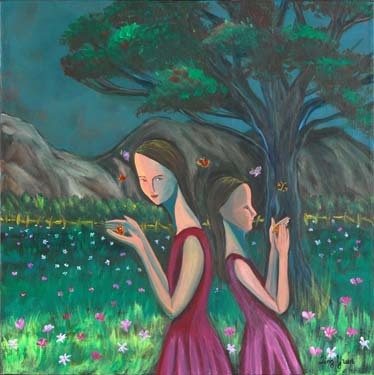 Capturing Spring is about not letting go of the childhood memories we had, the butterflies in the painting represent the wonderful memories that will remain with us forever.